Britain’s Prince Charles and Duchess of Cornwall Camilla undertook a hectic programme before concluding their visit to Sri Lanka last night. The Royal couple was in Sri Lanka to attend the opening of the Commonwealth Heads of Government Meeting (CHOGM) in Colombo. Their arrival in Colombo on Thursday (14) afternoon coincided with Prince Charles’ 65th birthday. Two cakes were ready for the Prince of Wales. One was at Westminster House where he cut a carrot cake topped with icing, as local and overseas children sang ‘Happy Birthday’. The Royal Couple were handed glasses of champagne and cheered ‘hip, hip hooray’ by guests. Following his arrival, he called on the President at Temple Trees where he cut a special cake marking his birthday. First Lady Shiranthi Rajapaksa, Defence Secretary Gotabaya Rajapaksa, Speaker Chamal Rajapaksa and External Affairs Minister G.L. Peiris were also present. On Friday the Prince represented Queen Elizabeth II at the opening ceremony of CHOGM held in Nelum Pokuna, Colombo. During their stay in Sri Lanka the royal couple undertook several engagements separately. Prince Charles visited the National Museum, Colombo, on Friday afternoon, where he was greeted by schoolchildren and National Heritage Minister Jagath Balasuriya. He spent some time conversing with the students and the museum staff. Prince Charles started his scheduled programme yesterday with a visit to historic Kandy that bears many reminiscences of British rule. The Temple of the Sacred Tooth was the Prince’s first stop. At the Dalada Maligawa, the Prince was escorted by sesath bearers to the Diyawadane Nilame Pradeep Nilanga Dela Bandara, who handed the Prince of Wales a tray of jasmine flowers to be placed at the foot of the Golden Karanduwa, inside the Inner Shrine Room. Ven. Tibbotuwawe Medhalankara Thera guided the Prince into the shrine room. 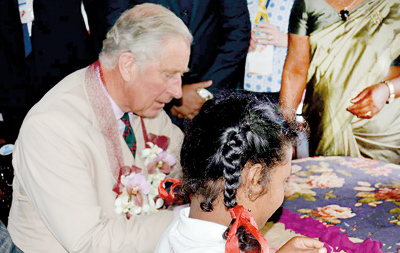 Prince Charles was also greeted by schoolchildren at the Maha Maluwa. Governor Tikiri Kobbekaduwa, Chief Minister Sarath Ekanayake and Kandy Mayor Mahendra Ratwatte were also in attendance. The Prince was also shown the memorial to Keppetipola. The Garrison Cemetery and the Royal Botanical Gardens in Perdeniya that bear memories of the British presence, were among the places visited by the Prince of Wales yesterday. During his visit to the Garrison Cemetery, the Prince also paid his respects to Sir John D’Oyly’s tomb put up by his surviving brothers, and visited the other tombs. The Prince then went to the Peradeniya Gardens where he was shown the area where Heads of State planted trees, including Queen Elizabeth. Later during the day, the Prince, along with the British High Commissioner in Sri Lanka, John Rankin, toured Nuwara Eliya, where he visited MENCAFEP, a school for differently-abled children. There he was greeted by the school’s founders Christopher and Ranji Stubbs who showed him around. At the School’s vocational training centre, the Prince admired the children’s creative work. He also took a short lesson from them to weave handloom. Following that, he stopped at the music room and spent a few minutes singing and dancing with the children. He spoke with the staff and parents at Mr Stubbs residence. In the meantime the Duchess of Cornwell was the Chief Guest at a Literature Festival organised by the Colombo Municipal Council, at the National Library auditorium. The Duchess handed over certificates to students who won Essay and Art competitions as a part of CHOGM celebrations. Duchess of Cornwall Camilla also visited the Lady Ridgeway Children’s Hospital in Borella, where she was greeted by children, parents and the hospital staff. The Hospital’s Director, Dr. Rathnasiri A. Hewage escorted the Duchess to a ward where she spent some time talking to the children, as she was shown their artwork. The Duchess then took part in a programme organised by the Women in Need (WIN) organization at its head office in Tickell Road, Borella. WIN provides protection and counseling to women and children who are victims of sexual harassment and domestic violence. The Duchess has shown great interest in addressing violence against women in the UK and other parts of the world. A group of young men and women showcased a street drama where they illustrated how women are being harassed in various circumstances. 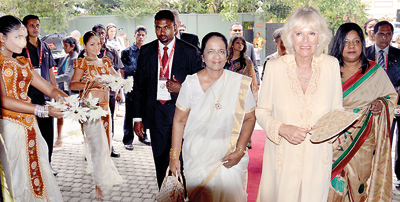 The Prince of Wales and the Duchess of Cornwall hosted a dinner at Cinnamon Lakeside Hotel, Colombo, for which the official programme stated that invitees could also wear decorations and tiaras.